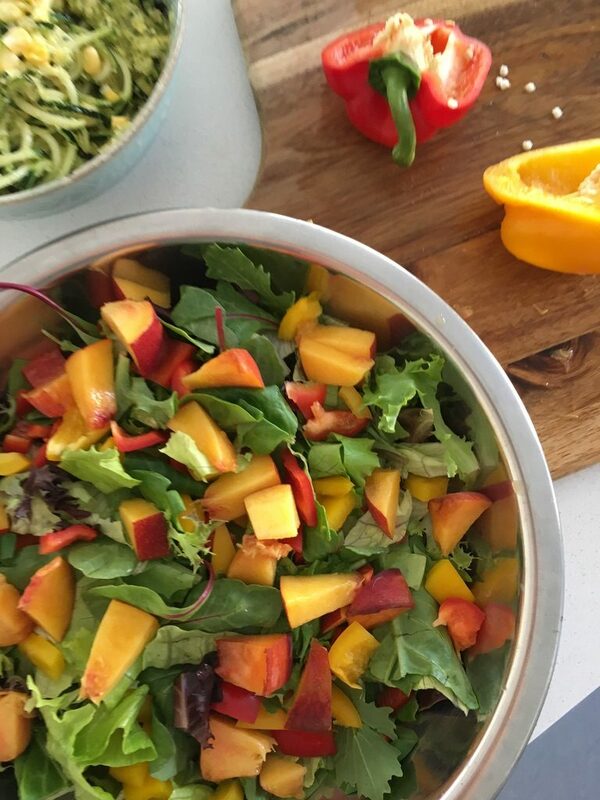 Today, we wanted to share with you an easy to follow guide that will help you create a delicious, nutrient-dense, powerhouse salad all year round. 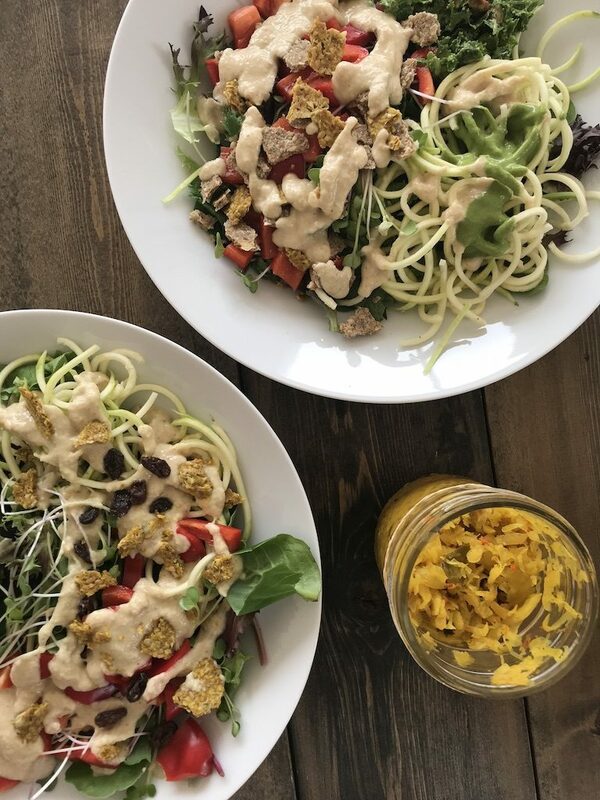 It’s no secret that we love vegetables and if you had a chance to follow any of our plant-based meal plans you already know that we recommend that you include at least one meal-sized salad into your diet daily. We could go on and on about the amazing nutritional benefits of eating one large salad a day, but since you are reading this post, we trust that you are well aware of the healing powers of fresh, organic raw fruits and vegetables, right? So let’s turn the page and talk about HOW to build the perfect healthy salad. One that is delicious, packed with nutrients, satisfying, life regenerating and includes seasonal produce. The goal is to put as many vitamins, minerals, nutrients and enzymes into your salad as you possibly can. It is essential that you use organic produce, which is free of toxic chemical fertilizers and pesticides. Locate a farmers market or local produce coop to collect some brightly coloured, in season, nutrient-dense foods for your salad. Refer to the recipe below for suggestions. Vegetables sold at your farmers’ market are picked at the peak of freshness, resulting in the best taste. To discover what’s in the season where you live, check out the Field to Plate Guide “What’s In Season in Your Region” for (USA) or in Canada the Cpma Fruit and Vegetable Availability Guide. Wash all produce for your salad thoroughly! We like to give even the “pre-washed lettuce mixes a quick rinse because well, you never know. Before assembling, make sure your greens are dry. You can just use a clean dish towel, or it might be a good idea to invest in a salad spinner. Chop everything up into tiny pieces. Chopping makes salads easier to eat especially for those who find eating them a bit of a challenge. Toss fresh herbs (parsley, cilantro, basil, dill) straight into the salad! Bright and flavorful herbs will blend beautifully with your greens of choice, all while amping up the flavour. Add visual and health appeal to your salad with the help of a spiralizer. This fantastic kitchen tool allows you to make thin tube-like ribbons and noodles out of veggies like beets, carrots, sweet potato and zucchini. Fun! Some harder greens will need extra prep called massaging – this simple process gently breaks down the cell walls making greens such as kale and chard softer, more enjoyable to chew and also easier to digest. How is it done? Simply massage chopped kale and chard with lemon juice, good quality olive oil, and sea salt for a couple of minutes using your hands. Assemble and dress your salad just before you plan on eating it. Salads rarely benefit from sitting around and often become soggy. Behind every great salad stands an even greater dressing. However, we advise that you stop buying those store-bought salad dressing! These highly processed condiments are loaded with calories and fat, not to mention all of the fillers and added stabilisers to make them last so long. Instead, experiment with making your own. Get some inspiration from our favourite dressing recipes below. WITH THIS SALAD GUIDE YOU CAN USE ALL OR SOME OF THE VEGETABLES RECOMMENDED. PICK WHAT LOOKS BEST IN THE MARKET. 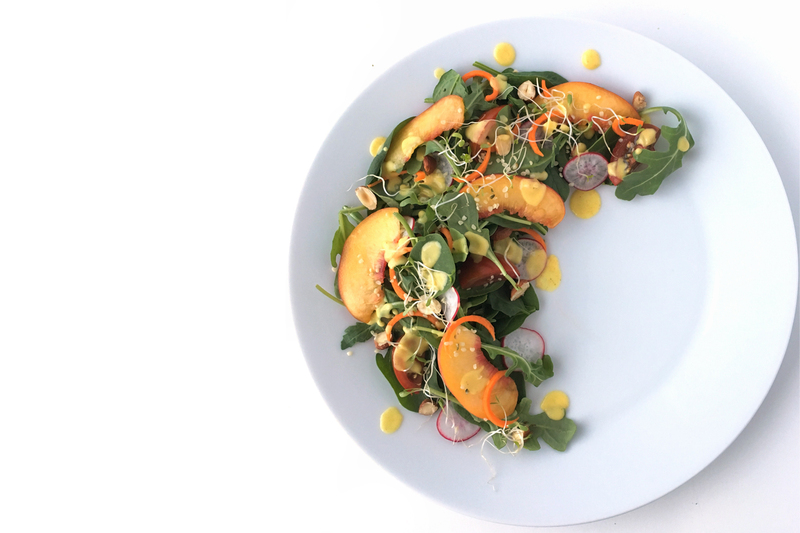 YOU WANT A RAINBOW OF COLORS FOR THE NUTRIENTS THEY PROVIDE AND THE VISUAL BEAUTY OF THE SALAD. A VARIETY OF COLORS HAVE LONG BEEN THOUGHT TO HAVE DISEASE-PREVENTING PROPERTIES. Shake all ingredients in a mason jar, drizzle dressing over salad, and toss. Using a blender – blend on high until smooth and pour over mixed greens. 1/2 cup raw sesame seeds (or tahini) Blend on high until smooth and creamy. Using a blender – blend on high until smooth, add water to achieve desired consistency. Using a blender -blend until smooth. Makes a great Dressing, Dip or Sauce. Eat salads like these every day and avoid processed foods with chemicals! You will get healthier, stronger, more energetic and happier by eating the foods that bring life and vitality to every cell in your body. Hope you found real value in this post we created or you. If you’re ready to improve your health and wellbeing, then it would be a privilege for us to help you make the next few months the single most significant time of your life yet. 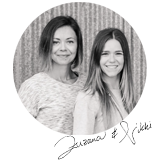 Here are the details about our transformative online course AV Plant-Based Coaching that has helped hundreds of people just like you get the positive results they could never see before. We believe in the program so much we’ve put a 100% money-back guarantee on this, so you have zero risks to try it out.